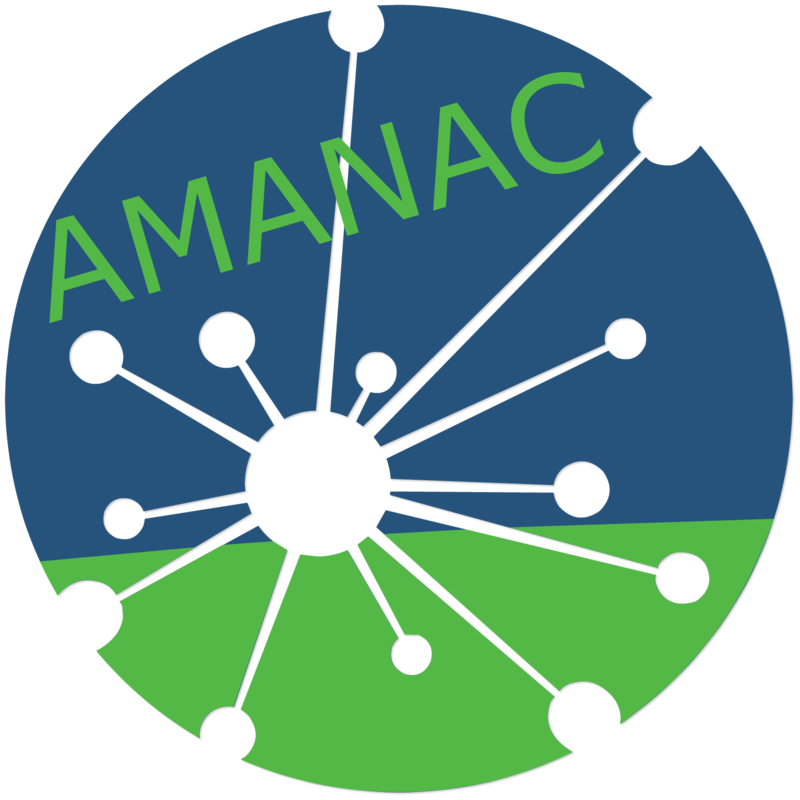 A number of technical terms are used to describe Life Cycle Assessment, its components, and related assessment methods. One term that is often used is Life Cycle Analysis, which is simply a synonym for Life Cycle Assessment. System boundary is defined as an interface between a product system and the environment or other product systems. It defines the activities and processes that will be included in each life-cycle stage for the LCA analysis and those that will be excluded. The figure below shows an example of a system boundary defined for conducting an LCA of a house. 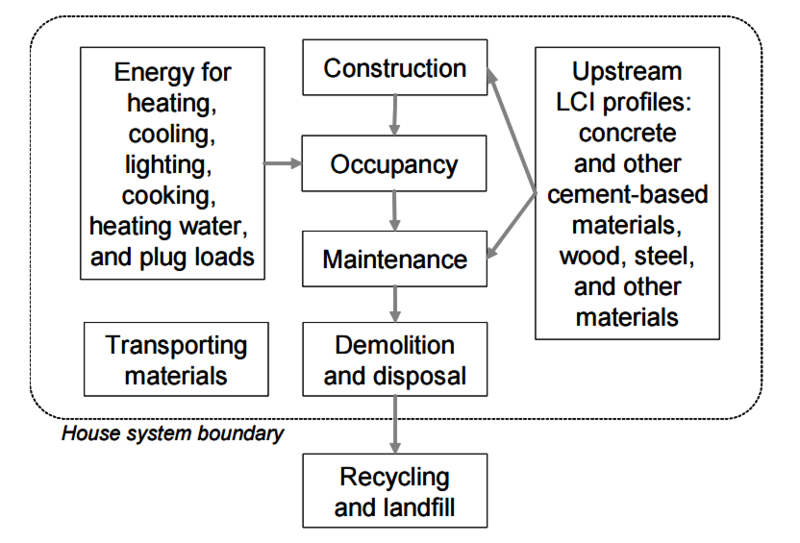 It can be seen that recycling and landfilling are not included within the system boundary as impacts because these two activities have not been accounted in the LCA. LCI data are at the heart of any LCA analysis. Several organizations and LCA tool developers have developed LCI databases that contain material and energy use data as well as emissions data for commonly used products and processes. These databases contain elementary flows (inputs and outputs) for each unit process for a product system and are specific to countries and regions within countries. The LCI data are region-specific because the energy fuel mix and methods of production often differ from region to region. The data can be based on industry averages or could be supplier-specific. The data in the LCI databases generally account for raw material extraction, transportation to a manufacturing unit, the manufacturing process, and packaging and distribution. Databases may contain industry averages or product-specific data. Industry averages make more sense in whole-building LCA tools, as these tools are designed to be used by architects to make decisions about assemblies at the schematic design stage. A specific supplier is not usually identified in early-stage design. LCC provides decision support in selecting a building system or whole-building design based on its financial benefits as opposed to LCA, in which a decision is based on the environmental benefits of a system or design. LCC provides a basis for contrasting initial investments with future costs over a specified period of time. The future costs are discounted back in time to make economic comparisons between different alternative strategies. LCC involves the systematic consideration of all relevant costs and revenues associated with the acquisition and ownership of an asset. In the context of buildings, this consists of initial capital cost, occupation costs, operating costs, and the costs incurred or benefited from its disposal. An LCC analysis is a data-intensive process, and the final outcome is highly dependent on the accessibility, quality, and accuracy of input data. A general lack of motivation to use LCC because it is a time-intensive process. Moreover, there is lack of confidence in the results. Clients are not willing to pay the architect or other consultant for the added cost of conducting an LCC, as there is a lack of awareness of its benefits. There is no standardized method. The nature of buildings makes the whole-building LCC methodically much more complex. There is significant uncertainty in operational cost data. The performance information about innovative green materials and technologies is missing. LCA and LCC when used together can lead to more holistic decision making. Most building projects are constrained by budgets. In a given scenario, LCA will produce results indicating the environmental impacts of different options. The option with least impact is proposed as the best solution based on LCA results, but this option might have a large initial cost. In such a situation, LCC can evaluate the life cycle cost of the option and help in selecting the most suitable option based on a limited budget and calculated payback period, while simultaneously managing environmental impacts. Life Cycle Energy Analysis, also referred to as Life Cycle Energy Assessment, is an abbreviated form of LCA that uses energy as the only measure of environmental impact. This helps in choosing energy efficient materials, systems, and processes for the life cycle of the building. Carbon accounting is the process by which CO2 emissions from fossil fuel combustion are calculated. Carbon emissions factors are expressed in many forms, either expressed as a mass of CO2 or only as the mass of carbon contained in the CO2, and may be expressed in any unit of mass. In case of buildings, carbon accounting would consider CO2 emissions from all life stages.Thus, carbon accounting can be described as a narrow-scoped LCA that is only targeted to measure the CO2 emissions for a building life-cycle. Malin, N., 2008. Counting Carbon: Understanding Carbon Footprints of Buildings. Environmental Building News. Marceau, M.L., VanGeem, M.G., 2008. Comparison of the Life Cycle Assessments of a Concrete Masonary House & a Wood Frame House. Portland Cement Institution. SAIC, 2006. Life Cycle Assessment: Principles & Practice. EPA. Trusty, W.B., Meil, J.K., 1999. 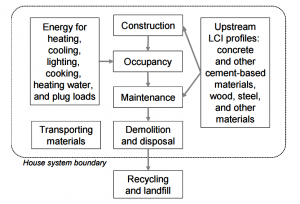 Building life cycle assessment: residential case study. Proceedings: Mainstreaming Green: Sustainable Design for Buildings and Communities. Chattanooga, TN.